NANCY DREW'S search for a flight of 99 steps to solve the mystery of a friend's weird dream takes her to France. But before she leaves the United States, an unknown person calling himself Monsieur Neuf warns the young sleuth not to pursue her mission. With her friends Bess and George, Nancy arrives in Paris to join her father who is working on another case: to find out what, or who, is frightening wealthy financier Monsieur Leblanc into selling large amounts of securities. Startling discoveries convince the young detective that Mr. Drew's case and her own mystery are linked by the 99 steps, and that a mysterious Arab has a strong hold over Leblanc. Is it blackmail? she wonders. Nancy's quest for further clues leads to the romantic chateau country in the Loire Valley, where a web of danger closes in tightly around the three girls. 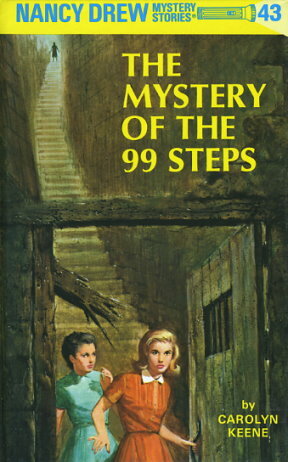 How Nancy unearths the exciting mystery of the 99 steps will hold the reader spellbound with suspense.